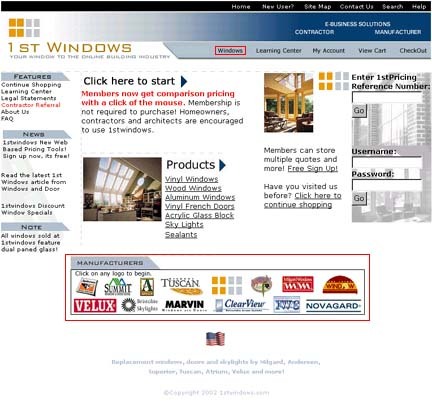 To shop and use 1stwindows.com it is not necessary to become a member, however membership is free and allows you use of our exclusive pricing tools such as comparison shopping and multiple bid generation and storage. If you choose not to be a member, this tutorial will guide you through the entire purchasing process. We recommend that you follow along through the site using the open window behind this one. Where instruction is given to click on a certain button that button or area will be inside a red box. This will make it easy to follow along. When your ready to go to the next step just click on the image below. To get started simply click on the "Manufacturers" logo box at the bottom of the home page or the "Windows" button in the navigation bar at the top of the screen.